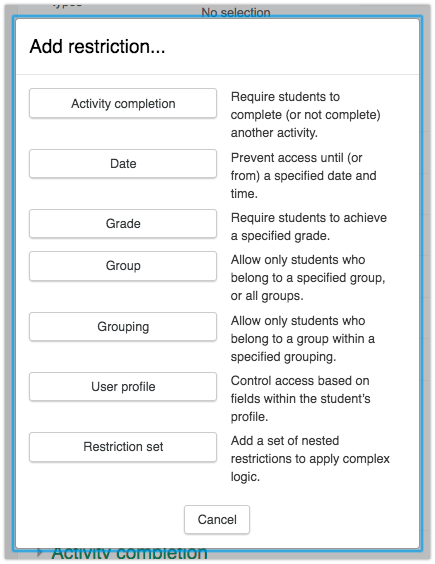 In some cases, you may wish to set conditions which limit whether a student can access a resource, activity or entire topic based on a number of different criteria, including time range, grade range achieved on previous activity, user information, group membership, or by accessing/completing another activity. Make sure to Turn Editing On in the upper right corner of your course's page. Click on Edit > Edit settings to the right of the activity you would like to restrict access to (or conditionally release), and scroll down to the Restrict access area. To add any restriction criteria, click the Add restriction button. To restrict the availability of an item on eClass based on the completion of another item, completion tracking must be enabled in your course. This sets up the possibility of having certain activities counted as complete. To see a more detailed description of how to do this, see the article Completion Tracking. Once this is enabled, you can then restrict access to items based on whether any other item is marked as complete. Click on Add restriction... button. Toggle the eyeball icon to either hide the item completely or show it greyed out with the restriction criteria listed. Select the activity/resource that must be marked complete. **The same basic options in the screenshot above exist for all the different types of access restrictions listed below. Select the date and times you would like the resource to be available from and/or to in drop-down menu (Note that times are based on the 24-hour clock). Enter the grade type and grade range for the activity that a student must attain in order to gain access to the current resource. Select the group to limit that item to. Select the grouping to limit that item to. In the first field beside User profile field, specify a field that can uniquely identify a user in your course (this would most often be the CCID). Change the operator to Contains or Doesn't contain etc. depending on your needs. Enter the student's unique identifier in the last box. If you need to open the resource or activity to a number of users, enter further user field conditions. If you are doing this for a large number of students, you would be better served to set up groups and groupings to selectively release the material.